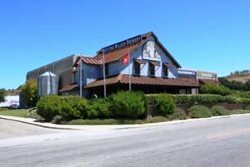 Sunday - Thursday - 5:00 p.m. to 8:30 p.m.
A Quiet Revolution out of the vineyards of California’s Central Coast, the Firestone Walker Brewing Company has grown to become an authentic regional craft brewery. We integrate traditional brewing discipline, a fascination with wooden barrels and a passion for the craft to create some of the most awarded Pale Ales in the world. The Taproom Restaurant located in Buellton specializes in brewhouse bistro cooking with an emphasis on local flavor. The Taproom is ultimately an extension of the Firestone Walker brewing philosophy—the finest and freshest ingredients, prepared with care and presented from a distinctively regional perspective. The Taproom is also home to Barrelworks. A “cathedral” of barrels, guests may take self-guided tours, learn about the art and methods of aging beer in barrels, and enjoy samples of the brewery’s rarest offerings.